The mission of our student ministry is to GIVE students the saving knowledge of the gospel, to GROW and equip them with this knowledge of the gospel, and to then send them out to GO tell others about the gospel. Our goal is to develop students with a passion for sharing the good news of the gospel message who will then make an impact in Tallahassee and all over the world. On Wednesday nights, students participate in group bible study which consist of worship, fellowship, and games. 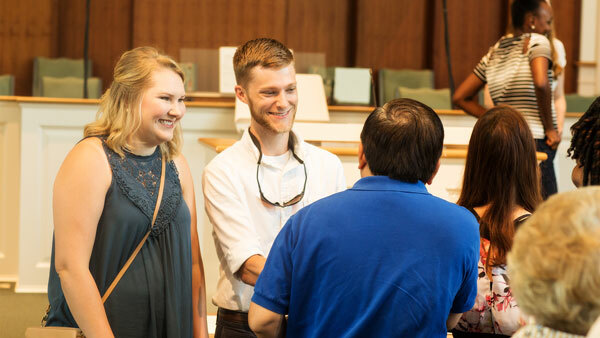 On Sunday mornings, students have the opportunity to be a part of our small groups. We also provide a variety of activities throughout the month where students have the opportunity to reach out and invite friends and neighbors. It is our hope and prayer that our students will be stirred to action and become involved in God’s kingdom work. A native of Wauchula, FL, Jared Jernigan graduated from the Baptist College of Florida with a Bachelor's degree in Leadership and Christian Education. Soon after, Jared married his college sweetheart Kalyn and both have been involved with East Hill since the spring of 2017. Jared is passionate about the upcoming generation and making sure they have the opportunity to hear the good news of the gospel, are discipled by and taught in the word of God, and have the opportunity to share their faith with those around them. Some of his hobbies include fishing, woodwork, and going to the movies. Our students are beyond excited to be attending Strength To Stand Camp once again this summer! From June 21-24, EHBC Students will be in Panama City Beach enjoying a time of worshiping our God, spiritually growing along-side other neighboring churches, and of course soaking up the sun at the beach. If you would like more information about this amazing, life-altering, summer camp experience and how your student(s) can be involved, make sure to check out the link below or contact our church office. If you need more information, would like to be added to our student newsletter, or have any questions about our student ministry, please leave your name and contact information so we can get back in touch with you.